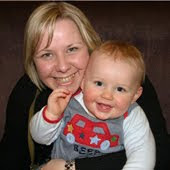 Another two LO's for you! My word, I'm on a roll at the moment! 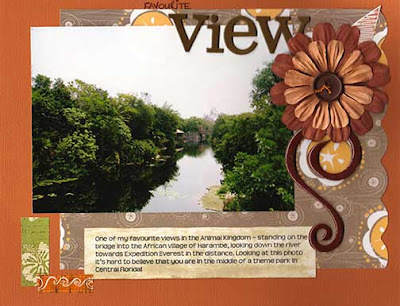 "One of my favourite views in the Animal Kingdom - standing on the bridge into the African village of Harambe, looking down the river towards Expedition Everest in the distance. Looking at this photo its hard to believe that you are in the middle of a theme park in Central Florida!" 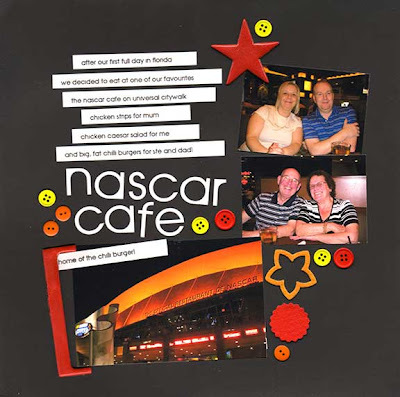 "After our first full day in Florida, we decided to eat at one of our favourites, the Nascar Cafe on Universal Citywalk. Chicken strips for Mum, Chicken Caesar Salad for me, and big, fat, chilli burgers for Ste andDad!" I have two layouts for you today! One I did last weekend, and one today - I have been completely lacking in inspiration all week, so I am pleased that I have managed to complete a LO today, and better still, I am happy with it too! Here I have used American Crafts A La Carte papers, KI Memories felt flowers and some more Autumn Leaves buttons. 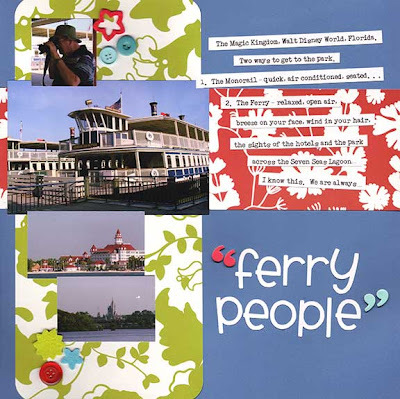 Pics are of the ferry across the lagoon to the Magic Kingdom - we much prefer the ferry to the monorail! And then we have some pics taken during the parade at the Magic Kingdom, I have used Basic Grey papers, Heidi Swapp tape, and American Crafts chipboard punctuation. I really like the bright colours I have used on both of these - makes a nice change for me! Another LO, this is one that I had originally done in 12x12, but I really wasn't happy with it so I just threw it to one side. But after last nights 8.5x11 experiment I thought I would have another go, so I cut the 12x12 layout up to make this one, which I like much better! The paper is Autumn Leaves French Twist, with AL stamps, and Prima Flowers. Live from the Top of the Tower! Here's my next Florida LO, and a bit of a change of format too. I just couldn't get this LO to work in 12x12, so I thought I would try 8.5x11 and I'm really happy with how it turned out! 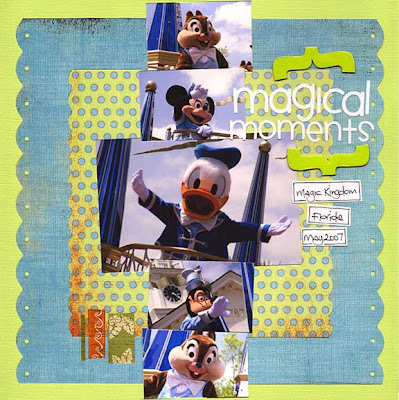 Plus I can still put it in with my other Florida 07 LO's as I got a great scrapbook from WDW which is actually a ring binder album, so I just punched a couple of extra holes in my 8.5x11 page protectors and in they went! 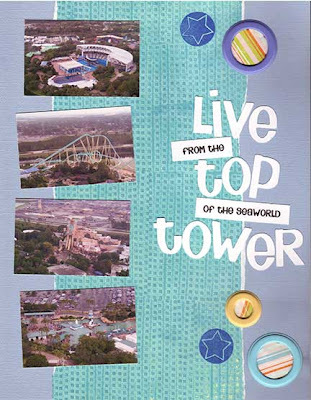 The pics were taken from the top of the SeaWorld tower, and I thought I would use Peter Kays first stand up show as my inspiration for the title. I have used some Sandylion and Crate paper, MM grommets and a Banana Frog stamp, the title was cut on the Craft Robo. 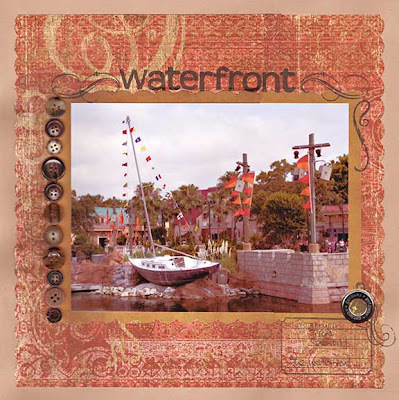 Have completed another LO for my Florida 07 scrapbook - picture was taken at the waterfront at SeaWorld, pretty much at the bottom of the SeaWorld Tower (just in case you know where that is!). The paper is K & Co (I think! ), stamps from Banana Frog, Technique Tuesday and Autumn Leaves, MM grommet, and some more buttons! Was nice to see some more sunshine today! Mind you, I nearly missed it considering I didn't wake up till about 11.30 - not like me! 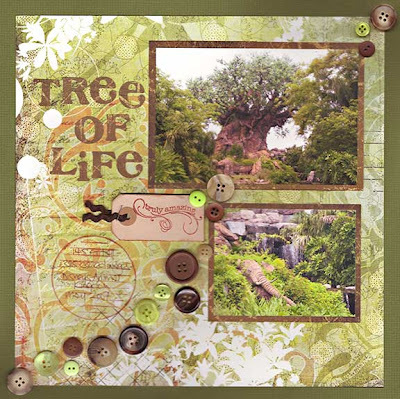 Have had another sort out of the craft room today, and also completed another Florida LO - this one is some pics I took of the Tree of Life at Disneys Animal Kingdom. I've used some Basic Grey Scarletts Letter and Hang 10 paper, lots of purdy Autumn Leaves buttons, and some Autumn Leaves stamps too. Might have to try and take a photo of it in daylight tomorrow, cos the colours look a bit washed out on the scan. Never mind - tis beautiful and strokeable in real life! It's sooooo nice to be at the weekend again. I think Friday evenings are almost my favourite part of the week.....work is done with.....the weekend still holds such promise! Especially when the weather is nice, like it has been this afternoon. Lovely and sunny, not quite up to Florida standards, but still good! 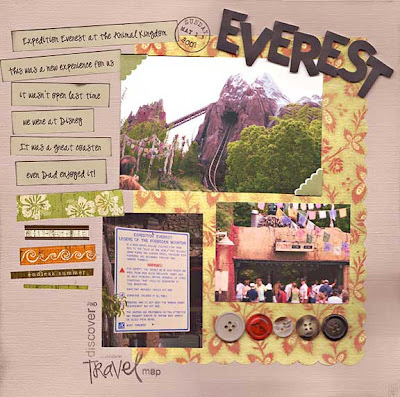 Have just finished my first LO for this Florida trip.....I started off with Expedition Everest at Disneys Animal Kingdom. It was the first park we visited, so I thought it might as well be the first LO! 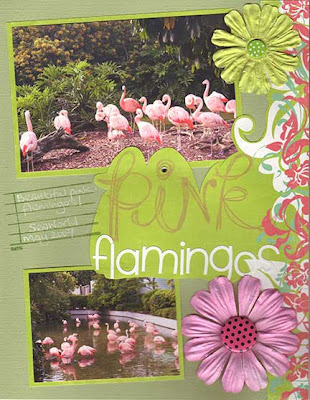 Have used lots of my lovely Florida stash - 7 Gypsies paper, Heidi Swapp tape, corner stamp and photo corners, some of my lovely buttons, and a stamp from the Banana Frog Postage set.